Videogames have received some unexpected crossovers lately, with the most recent one that comes to mind being an Assassin’s Creed: Origins/Final Fantasy XV tie-in. Now Capcom has their own entry into this escalating competition, announcing that Aloy from Horizon: Zero Dawn will appear in their very own Monster Hunter: World. The revelation came during Sony’s onslaught of news and announcements for Paris Games Week. 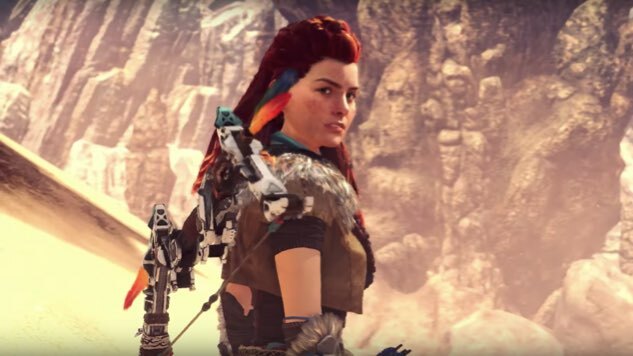 Aloy will come equipped with her signature bow and will don armor from her game, and the content will include Palico armor that will make the player’s Palico appear as a machine from Horizon. This content will be downloadable for free sometime after the game’s launch, and will be made available through an Event Quest that will have you gather necessary materials to forge the equipment.